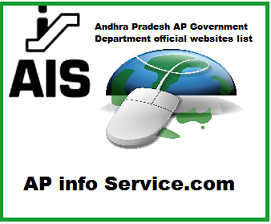 101 Andhra Pradesh state Government Departments official websites list - AP GOS websites list, Andhra Pradesh Citizens every day searching government related information and services online.Here Provide 101Andhra Pradesh Govt Websites. This content very helpful to searching and easy & Quick log on to Important Andhra Pradesh government official website. just copy the website link and paste your favourite web-browser. This content information purpose only.